The Dutchtown South Community Corporation needs you to get involved! Several opportunities are currently available. First, there is always a need for volunteers in the office or for neighborhood outreach. If you have an hour or two to spare every month, please sign up here to volunteer. 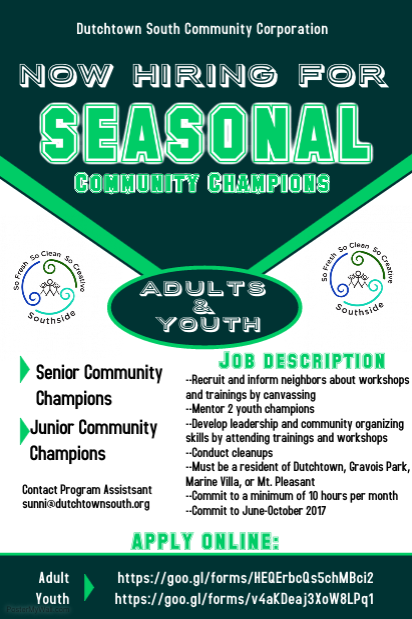 DSCC is also looking for Junior and Senior Community Champions to work on their So Fresh, So Clean, So Creative Southside initiative. Click here for a youth application or here for an adult application. Finally, there is an Americorps VISTA position available for a Development and Partnerships Manager beginning this summer. Find out more about this opportunity here. Read more news about Dutchtown.